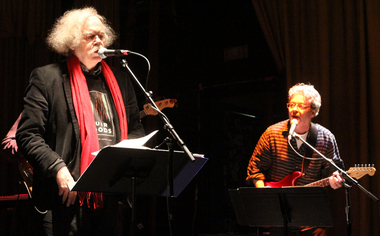 Ed Sanders, left, and Steve Taylor of The Fugs at the Beachland Ballroom Friday, November 30, 2012. The old saying goes that anyone who remembers the ’60s probably wasn’t there. Well, The Fugs still remember the ’60s, even if some of the details are a bit fuzzy. “This one opened on the Billboard charts at 150 with a roach clip,” announced their irascible frontman Ed Sanders during their Friday night show at the Beachland Ballroom. It’s been 44 years since Cleveland laid eyes on the cult ’60s rabble-rousers. Last seen at La Cave in 1968, Sanders resurfaced with the Fugs on Friday for a two-set show that went some 25 songs deep. It was striking how much, and little, had changed since the band’s heyday. The Fugs themselves are obviously a bit longer in the tooth. The lineup has changed a bit. Steve Taylor, Coby Batty and Scott Petito have been around since Sanders and Tuli Kupferberg reformed the band in 1985. But the biggest change is clearly the absence of founding member and songwriter Kupferberg, who died in 2010. Songs like “CIA Man” and “Kill For Peace” didn’t sound out of time or place Friday night; in fact they sounded more direct and necessary than a good chunk of the current protest music. Still, time has changed the timbre of other songs. At 73 years old, Sanders sounds less incensed shouting the profane chorus to “Wide, Wide River” and more frustrated, disgusted and, ultimately, resigned. And, some four decades removed from the height of the psychedelic rock era, “Crystal Liaison” sounded more like a campy, Weird Al-style homage than criticism. The band seem to be enjoying themselves while not taking any of it too seriously. Lyrics sheets were constant companions — maybe that thing about remembering the ’60s is true — and most songs took a few bars for everyone to get on the same page. And maybe that’s appropriate, as The Fugs have always been about the primacy of the message over the medium. In the end, for all The Fugs’ ire and indignation at the government, even after almost 50 years, it’s clear that Sanders and company still haven’t given up on America. “No country that invented the wah-wah pedal could be totally evil,” said Sanders. Cleveland’s Filmstrip opened with an excellent post-punk set that, unfortunately, seemed a bit wasted on the crowd there to see the decidedly less fuzzy-sounding, if more fuzzy-looking, Fugs.